Vancouver Westside is Home to Vancouver's Best Beaches, Trendy Shopping, Top Schools and Popular Vancouver Neighbourhoods. Vancouver’s Westside offers some of the top academic schools, prestigeous neighbourhoods, luxury laned homes, condos and unique Craftsman townhomes. Explore the quiet neighbourhoods with tree-lined streets, browse the trendy shops on West 4th, take a drive to UBC and don’t forget a scenic stroll along Kitts beach. Discover the Top Neighbourhoods on the Westside. Vancouver's Westside is home to a diverse array of neighbourhoods, each with its own unique culture, lifestyle, and housing options. Below is a list of Inhabit Vancouver's top neighbourhoods on the Westside, click on your selected neighbourhood to browse all real estate listings currently for sale. Kitsilano is a neighbourhood which is located in the Westside of Vancouver. View real estate listings currently for sale in the Kitsilano neighbourhood. Point Grey / UBC / Dunbar is a neighbourhood which is located in the Westside of Vancouver. View real estate listings currently for sale. Fairview is a neighbourhood which is located in the Westside of Vancouver. View real estate listings currently for sale in the Fairview neighbourhood. Cambie / Mt Pleasant is a neighbourhood which is located in the Westside of Vancouver. View real estate listings currently for sale in the Cambie / Mt Pleasant neighbourhood. Shaughnessy is a neighbourhood which is located in the Westside of Vancouver. 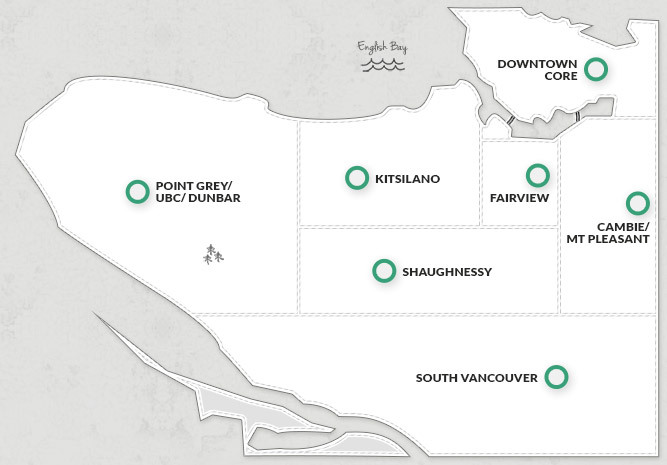 View real estate listings currently for sale in the Shaughnessy neighbourhood. The Downtown Core is a neighbourhood which is located in the Westside of Vancouver. View real estate listings currently for sale in the Downtown Core neighbourhood. South Vancouver is a neighbourhood which is located in the Westside of Vancouver. View real estate listings currently for sale in the South Vancouver neighbourhood. Vancouver Westside Houses, Condos and Townhomes for Sale. The Vancouver Westside real estate market offers some of the most affordable home options in Vancouver. Whether you are looking for a house, townhome, loft or condo for sale, you'll find a full range of housing options and neighbourhoods to fit your home and lifestyle needs on the Westside. West Vancouver Schools, Local Amenities and More. Find the perfect place to live to on the Westside for your lifestyle needs. Explore Vancouver Westside schools, shopping, recreation and local amenities. Browse community resources below or click on a link for additional information. Vancouver's Westside offers a variety of shopping malls, street markets and upscale boutique stores. Explore some of the best shopping areas including the South Graville shopping district, Granville Island market and take a stroll along West 4th. Vancouver's Westside boasts ample parkland and beaches including Queen Elizabeth Park, Pacific Spirit Park, Kits Beach and Spanish Banks. Only minutes to Downtown by car, bus or SkyTrain, or explore the many bikeways and trails. Interested in Buying in Vancouver Westside? We’re Here to Help.